Figs are a sweet little Paleo-friendly fruit that can be enjoyed fresh from the tree during the summer and early fall months. Figs are perishable and should be eaten within a day or two of purchase. For the best fig selection, buy figs at the farmer’s market when they’re freshly picked, then eat them later that day or the next. The skin color of a fig ranges from dark purple-dark to a light green-yellow color. However, the taste, texture and preparation will be fairly similar for all varieties. 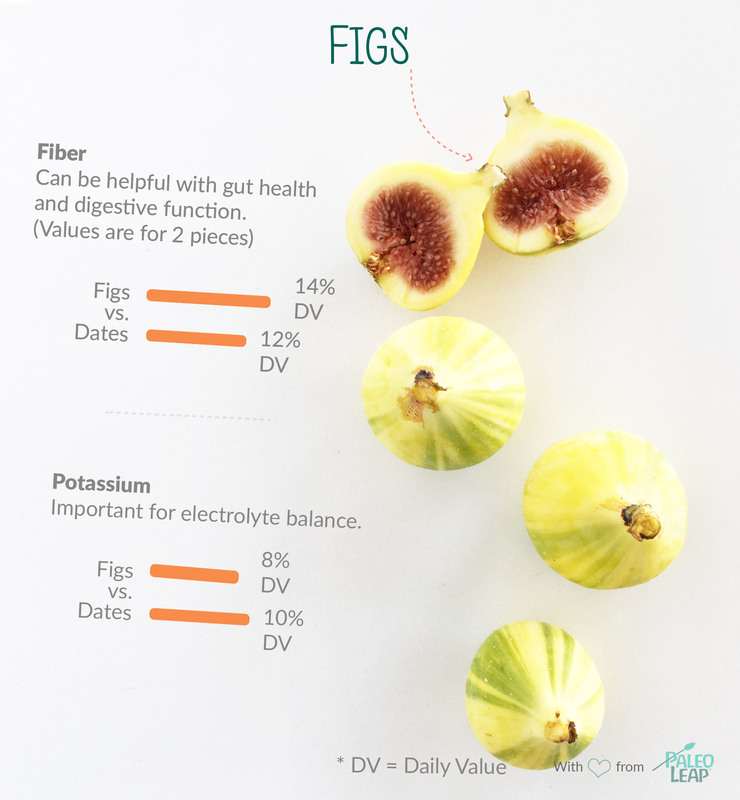 Figs are a great source of fiber, potassium and antioxidants. Because figs are naturally sweet (they contain 20 grams of sugar per 2 figs), dried figs or fig paste can be used as a sugar replacement in certain baking or bar recipes. Caramelized or lightly roasted figs make for an excellent dessert, too! Orange dots show how 2 large figs fits into the typical nutrient profile of a Paleo meal. FRESH OR DRIED: Dried figs are available year around (found in packages or in the bulk bin section); fresh figs are available during the summer and early fall months. SELECT: Fresh figs should be plump and have a sweet smell, but not mushy. Figs are perishable, so should be used within a day or so of purchase. VARIETIES: The skin color of a fig ranges from a dark purple-black to a light yellow-green skin. The flesh of a fig ranges from light pink to dark red. Heat ghee or a cooking fat in a skillet over medium heat, then add halved figs. Cook for 1-2 minutes, until figs begin to caramelize. Top with cinnamon or salt. Add figs to a salad with mixed greens and a honey-sweetened salad dressing. Make a homemade fig jam or chutney. Use dried figs (in lieu or addition to dried dates) in a snack ball or bar recipe.